Surely the most famous battle in Western European history, Waterloo was the finale to the astonishing career of Napoleon Buonaparte. Exiled , he returned to an astonished but apparently grateful France , raised an enormous army in short order, and set out to destroy his enemies' armies in a swift campaign . The first blow fell on the Prussians , under Blucher, and then on the Anglo-Dutch army of the Duke of Wellington. The crisis came on the morning of the 18th of June 1815 in a gentle broad valley south of Brussels , a hot and sultry day following a night of torrential thunderstorms. 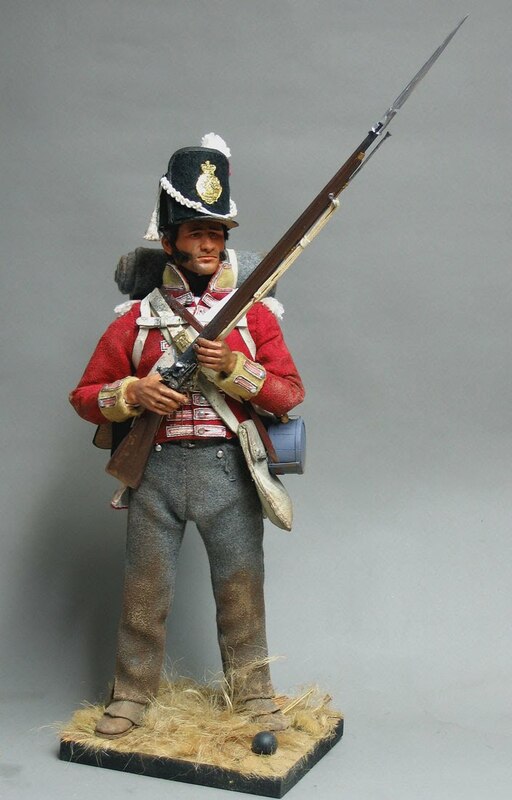 The Anglo-Dutch army was a very mongrel hybrid of German , British , Dutch and Belgian troops, most of them very inexperienced. The Prussians , who arrived to support their Allies in the nick of time, had received a dreadful drubbing at Ligny two days earlier. The French were at least a coherent monolingual force , many of them veterans . 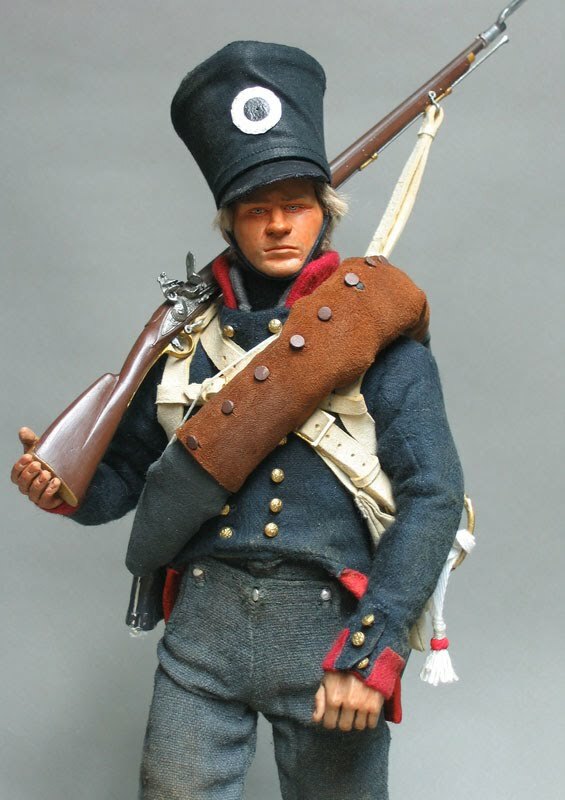 These figures are mostly scratchbuilt, though I have used some of the commercial items from DiD , such as the French coat, trousers and gaiters, but everything has been heavily modified or even totally rebuilt. 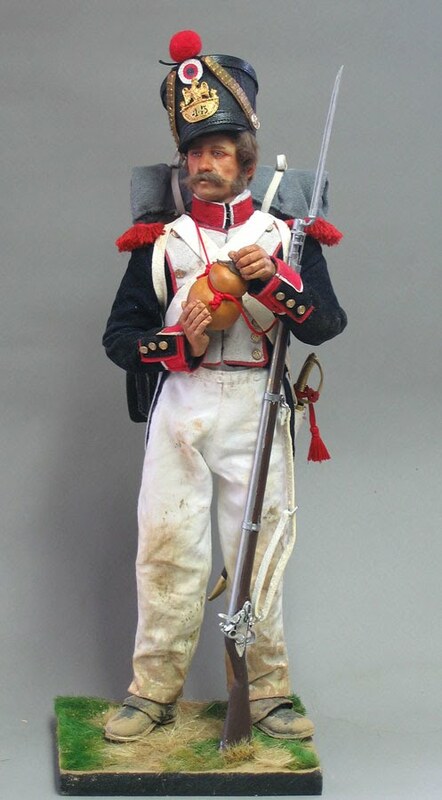 All of these figures have had their uniforms retailored or made from scratch , with the buff equipment made from deerskin , and other items made from suitable materials.